Rangle had the pleasure of hosting a sold-out crowd of Lean Innovation experts and enthusiasts at our new office yesterday. 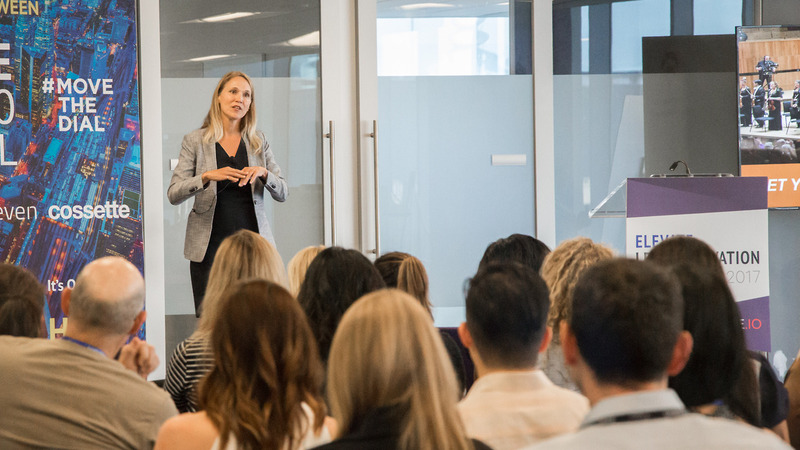 As part of the Elevate Toronto Festival, the event sought to celebrate Canadian innovation through the lens of what it means to embrace lean methodologies in today’s world. Our CEO, Nick van Weerdenburg, put lean innovation into context in his opening remarks, saying that innovation is not only something to be embraced across all industries and companies regardless of size, but something to strive for. Whether a startup or a legacy enterprise, all companies have the power to harness a shift in thinking that can propel growth and foster new ideas. Lean innovation thinking inspired him when he first started Rangle with the desire to work with next gen clients using next gen technologies and it's one of the pillars Rangle stands by today. A fireside chat between Nick van Weerdenburg and Lisa Durocher, Chief Digital Officer at Rogers, looked at some of the challenges matrix organizations like Rogers face when it comes to lean innovation. One of the biggest roadblocks for Durocher is that innovators must not only be really good at coming up with ideas but also convincing people that those ideas can deliver. For her, the idea of building an omnichannel experience that would result in a single customer interface that connects to all applications wasn’t the hard part; the biggest challenge was convincing the matrix that it was the right idea. With large legacy organizations, there is often technology and processes that have been in place for decades, so as a result the back-end system doesn’t necessarily reflect what consumers experience on the frontend. Durocher, who worked at American Express in New York City before moving to Rogers to serve as Senior Vice President of Digital and then Chief Digital Officer, said the key is in the data. She was able to secure buy ins from stakeholders by illustrating the problem she was trying to solve with data: everything from how many people worked on projects to how often funding needed to be increased was tied to the results of QA testing. Part of the conversation revolved around dealing with a younger consumer base. Nick van Weerdenburg mentioned that for younger customers used to self-serve, it can feel like a burden when they have to talk to somebody. The challenge then is to find solutions that are both modern and proven. Again, analyzing data and using that data to fuel solutions is the key to success. In his talk on frictionless banking, Dave Dame, Agile Leader at Scotiabank, delighted the audience with an insightful and humorous talk about innovation’s role in modern banking. “Innovation has moved to the unsexy. That’s right. Innovation has moved into the banks,” he said. It has become imperative for FinTech organizations to ensure they’re meeting the customer where they are in order to avoid creating friction when delivering a customer experience. In the digital ecosystem, this means meeting them in their devices. The industry has a lot to catch up on, Dame said, not just from a business standpoint but also in terms of delivering the experiences consumers have become accustomed to. He talked about Scotiabank’s Digital Factory, a series of five startups that operate within Scotiabank in five markets: Canada, Peru, Chile, Colombia and Mexico. Here they employ people you wouldn’t normally associate with finance for precisely that reason: to tap into the innovative thinking of those more aligned with the startup world. With customers changing more rapidly than businesses can keep up, Dame urged those in FinTech to consider how to appease new customers who have a “better appetite for risk” without alienating existing customers. A balance must be achieved, which is perhaps one of the trickiest challenges for today’s FinTech organizations. It’s not just a technology problem, but one of governance, regulatory compliance, and risk. Disruption in FinTech, he said, must be done responsibility. Drawing on his own experiences as a man who uses a wheelchair, however, Dame also left the audience with something to consider. In a personal anecdote, he shared how technology like Apple Pay has drastically changed his life, allowing him better access to things many take for granted, such as the ability to easily buy a coffee and enjoy it with friends in a coffee shop. In one of the most entertaining talks of the day, April Dunford, Founder of Rocket Launch Marketing, discussed why a lack of context is why many products and businesses fail to get off the ground. “Context can kill even a great product,” she said. To put in perspective, she shared the story of a Washington Post experiment where acclaimed violinist Joshua Bell performed in a metro station in everyday clothes. This is someone who performing with the National Symphony Orchestra is just one of his many accomplishments. When placed out of context, most failed to stop or even notice the man playing violin, let alone the calibre of his talent. The context of a product, she said, is used to make the obviousness of a product obvious. Things need to have a frame of reference to succeed. “In my entire history of doing this stuff, we almost never set context deliberately. We ignore it completely. Worse than that, we make a decision at the beginning of our product cycle that there is only one way to position the product,” she said. For businesses, context is set by competition, channels, pricing, customers, branding and packaging, expected features (or features we choose to focus on). New products require a new way of thinking. “It isn’t enough to innovate on a product or the features of a product. You have to be thinking about how are we going to develop a way to think about how awesome it is,” she said. Another example she gave was Otto Motors. It’s a robot that was repositioned as a self-driving vehicle that increases productivity. How can you replicate this? Let go of the past.Take whatever it is you always thought your product was and then open your mind to the idea that the thing that you developed is actually something else. Don’t get too tied to your original idea. Position it in a market where your unique value is obvious. “I want you to think about how you’re context setting the new things you’re delivering,” she said. In other words, it isn’t enough to develop a cool thing the world hasn’t seen before, you have to position it into the world in the right context so that the awesomeness of your product is seen for what it is: awesome. This is part one of our takeaways series from the Lean Innovation track at the Elevate Toronto Festival. Stay tuned for part two with five more lessons coming soon.